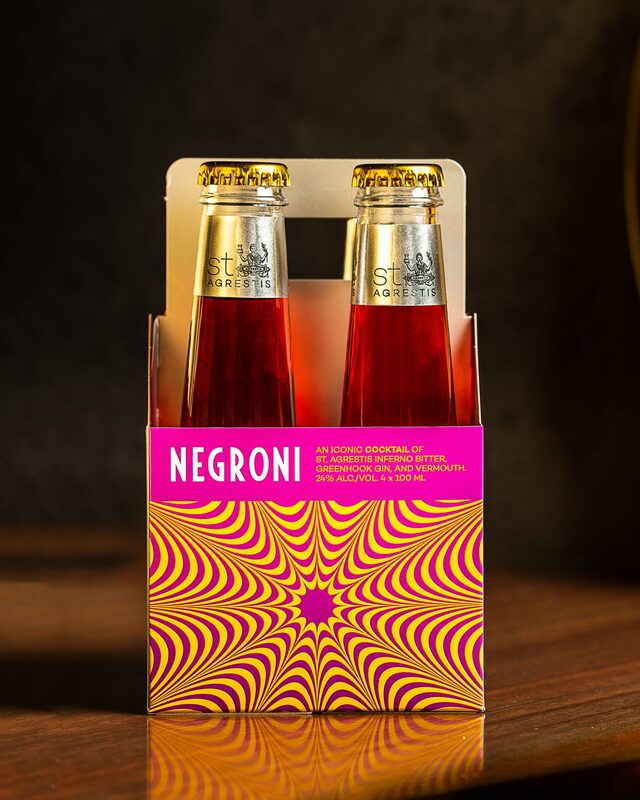 Not only are these new bottled negronis perfect for covert beach drinking, but they're easily dressed up, so you can pretend you made them yourself. Every week, we're publishing This Good Thing, where we'll feature a restaurant dish, store-bought food item, kitchen tool, or food-adjacent obsession that we can't stop thinking about. Over the past few years, bottled cocktails have experienced a spectacular renaissance, with just about every craft cocktail you could imagined rolled out in adorable bottle form. (Canned cocktails are continuing to impress us, too.) The super-portable format has made possible what, at one time, seemed unthinkable: Covertly drinking a negroni on the beach without having to lug a tote back full of individual ingredients through the sand. One new remarkable bottle negroni, just released by Brooklyn-based amaro brand St. Agrestis, is our current summer crush: St. Agrestis Bottled Negronis, sold in packs of four, retail for $24.99 (or $6.49 for each 3.3 ounce bottle) and taste just as lovely as any $15 negroni you'd find in the city. The ingredients are excellent. Made with St. Agrestis Inferno Bitters, Greenhook American Dry Gin (from Greenpoint, Brooklyn) and a red "Torino-style" vermouth, the negronis pack smooth, balanced bitter-sweet flavor and are supremely refreshing. If you're serving them at home and want to dress them up (even though the retro bottles are super cute), here's what you need. If you want to evoke old-school Italian glamour, the way any good negroni should, splurge on a nice glass—you can get creative and choose what you like best; you won't get in trouble for breaking convention. We enjoy negronis out of martini glasses and old-fashioned glasses. We like these old-fashioned glasses (on Amazon). A twist of orange peel. That's it. There are a couple schools of thought for choosing the proper ice for a negroni. (FYI, ice matters a lot.) We like one big block or sphere for a negroni, so the ice lasts throughout the cocktail-drinking experience without watering it down too much. If you're looking to get a little more creative with your negroni—as in, actually making it yourself—here are three twists on the classic cockail that we'll be making all summer.